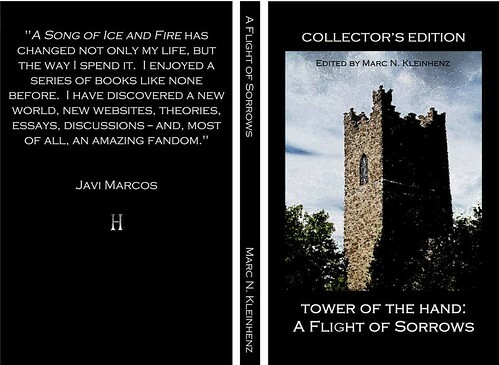 A Flight of Sorrows Collector’s Edition has been released, available on CreateSpace and Amazon through our podcast store. It will not be available after November 1st, so if you would like a copy, this is the month to go for it. In relation to our podcast, it contains Mimi’s essay A Telltale Knight and Amin’s essay A Game of Beds, as well as Amin’s new essay A Feast of Vipers, Kyle’s afterword Completed Songs and Frozen Conversations, and a 2011 interview with our podcast. Another thing only open during the month of October (until Oct 15th) is the 9th annual Podcast Awards nominations. If you would like to nominate our podcast, each person may submit one (only one) nomination form by October 15th. The podcasts with the most nominations will be added to an online voting system later this fall, so every nomination does count. If you nominate A Podcast of Ice and Fire, we suggest the People’s Choice + Entertainment categories (any podcast can be nominated for People’s Choice + one category). If you get the chance, please submit Bastards of Kingsgrave under the Cultural /Arts category in that same nomination form (website – (http://bastardsofkingsgrave.wordpress.com/). The 9th Annual Podcast Awards Ceremony will be Held at New Media Expo in Las Vegas on Sunday Jan 5, 2014. I was wondering if you know whether the collectors edition will be available in the amazon.de store? There is already an entry, but the release date of october 1st is long behind us and still there is no release. That is interesting that it is showing up there at all. Is it allowing you to order? I’ll check and get back to you but I’m fairly certain that you won’t be able to order it through another Amazon. Edit – our editor double checked and apparently it is possible it might actually be available for sale on Amazon Germany. That is, Amazon has the right to sell it through that any European Amazon store. However, they generally take weeks or months before they start doing that, and the book will only be on sale during October. So you could wait until just before the end of the month if you wanted to see if it appears there, then order from here if it doesn’t. Hope you got the last message, as info we got from editor updated what we knew before. thanks for the quick reply, this is more or less what I feared. So I think I am not going to risk missing the deadline and order from createspace. Thanks for the amazon.uk link, that does make things easier!